Xbox announced details about the January Update for “Gears of War 4.” The update is live now, this update introduces a huge 280 new Cards to collect, two of the most popular maps in franchise history, and hotly requested community features that further improve the “Gears of War 4” online experience. Series 2 is here, bringing with it our biggest content drop to date with 280 new Cards to collect. From iconic characters of the past, to a wealth of new weapon skins, there is something for everyone in this latest drop. All Series 2 cards are available in standard Gear Packs and are craftable using Scrap. Thirteen (13) new characters are up for grabs in Series 2, including the first delivery of Legacy Characters in “Gears of War 4!” Armored Anya and Armored Sam are back in their Gears 3 armor, and Zombie Minh rises from the dead (sporting Raam’s blade-sized hole in his chest!). Additionally, there are over 260 new Weapon Skins to collect across 13 full weapon skin sets. This month, two fan-favorite maps come to life in Gears of War 4: Blood Drive and Clocktower! Blood Drive - Blending together the best of Gears 2’s original take and the Gears 3’s re-imagining, Blood Drive in “Gears of War 4” brings back intense, center-map pillar fights with the improved flow of its refined sibling. Spawn at the Diner or the Morgue, then head to the city streets to battle it out over the Longshot and Overkill. Clocktower - Clocktower also returns to Gears of War 4, re-imagined as the stunning Bank of Bronn as it’s slowly claimed by the Swarm. The imposing classic Gears architecture brings back memories of the battles you know and love, from the intense close-quarters combat in the lower streets to the Lancer-heavy crossfire at the Bank entrance. Both maps are available to Season Pass holders in the Developer Playlist now (including Double XP and 20% more Credits), and will be available for free for everyone in Public Play starting January 17th. Xbox is excited to announce the Series 2 Airdrop for Season Pass holders! Arriving January 13th, this special Season Pass Airdrop is loaded with twenty Gear Packs containing sixty random cards from the Series 2 Characters and Weapon Skins, giving you a head start on building your new collection of content. This new Airdrop will be awarded to anyone who has purchased the “Gears of War 4” Season Pass, and instantly to any new Season Pass holders from that date onward. In addition, Season Pass holders will also now be able to log in and claim a bonus Bounty Gear Pack every Friday! Alongside the release of Series 2, Title Update 3 brings the first phase of a hotly requested community feature – quit penalties. The new matchmaking timeout system punishes leaving the fight early, while our Join In Progress feature gives you the flexibility to rejoin the battle for a short time – if, say, your dog tripped the power cable. It happens. This new update also contains improvements to Spectator Mode, keeping the action front and center while adding new features that give you more information about the intense eSports action playing out live. See it in action this Wednesday, January 11 for the first time during the Gears eSports Fight Night from 3pm PDT on live.gearsofwar.com. 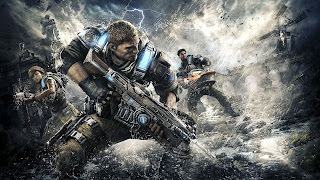 For additional details about the “Gears of War 4” Series 2 Collection of Cards, new multiplayer maps, special January events and more, please check out Xbox Wire.